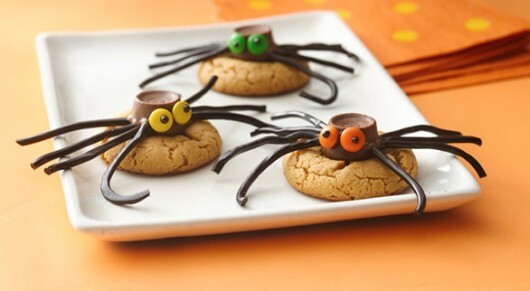 Let’s get spooky creative this Halloween with these fourteen Halloween treats. 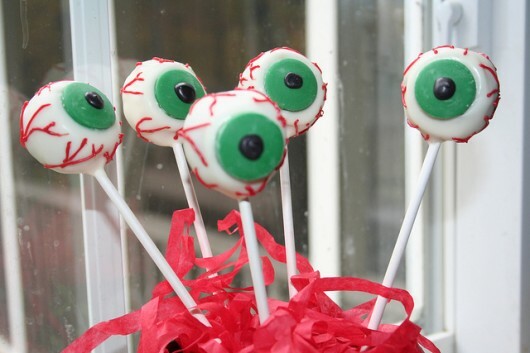 Stick the lollipop into a cupcake. Roll fondant base nice and thin and drape it over the lollipop. Do a little trimming. Melt dark chocolate and paint eyes. 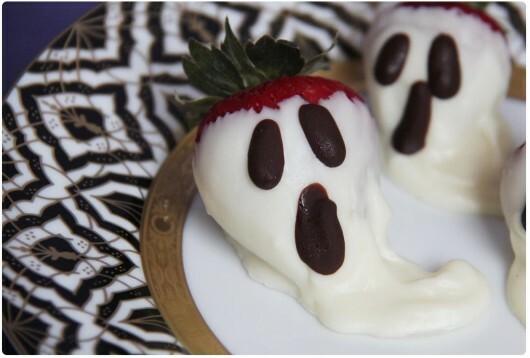 Melt white chocolate, dive each strawberry into the chocolate and set on the plate. 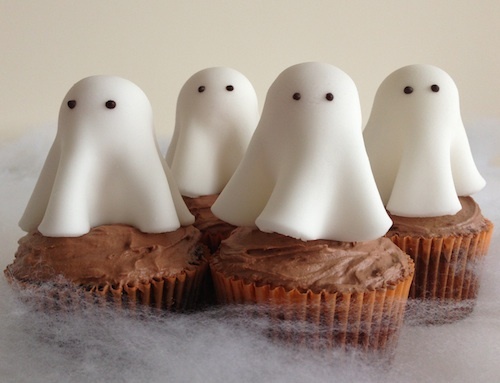 Allow the excess chocolate to pour off on the plate to form the “tail” of the ghost. 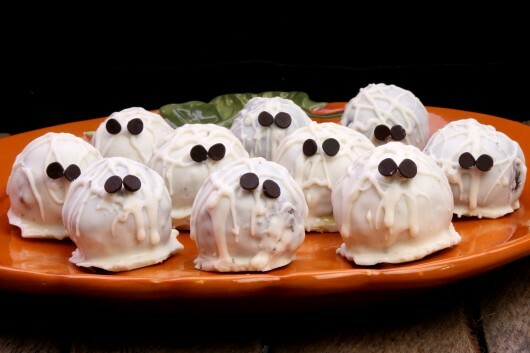 Use dark chocolate or mini chocolate chips to make eyes and mouth. Combine the cream cheese and Oreos in a bowl. Blend well to make a dough. Roll the balls and put in the freezer for 10-15 min. Melt white chocolate. Dip each ball into the melted chocolate. The chocolate should be warm not hot not to ruin the balls. Decorate your balls drizzling the remaining chocolate over each bite. Remove to the fridge. 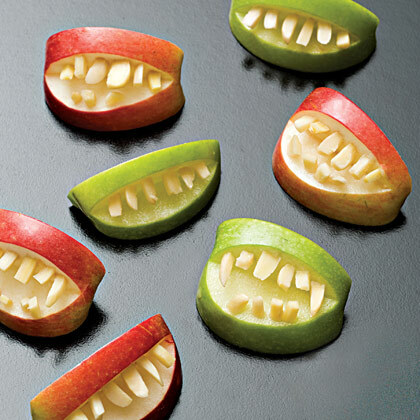 Cut apples into quarters. You can add jam or nut butter but may leave the bites empty. 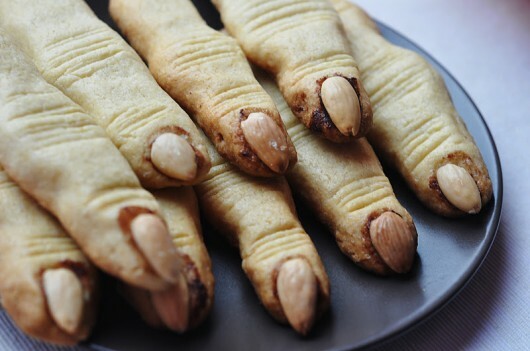 Add slivered almonds in for the teeth. You can substitute nuts with seeds. The whole recipe is here. Crash Oreos and spread it on the plate. Cut bananas in half and set on the plate. 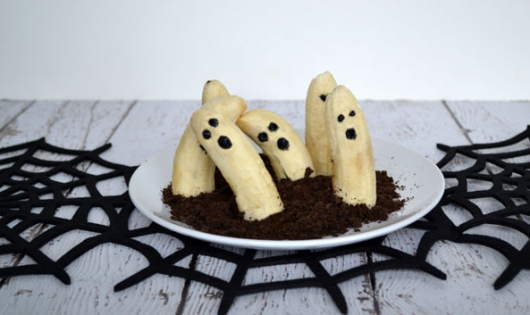 Decorate bananas with dark chip “eyes”. Peel little clementines or oranges. 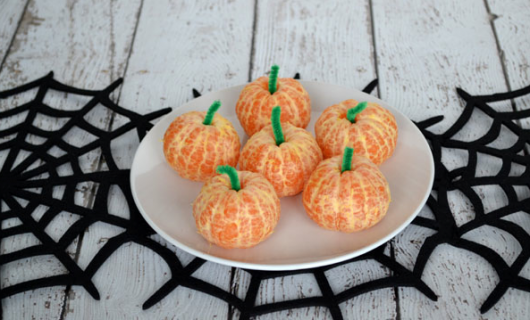 Add a piece of celery into the top so that it looks like a pumpkin stalk. Melt white chocolate then split chocolate between two small mixing bowls. Stir orange food coloring into one bowl and yellow into the other until colors are consistent. Dip marshmallows, one at a time, in the orange white chocolate mix . Set aside. Continue with the yellow white chocolate mix. Set aside. 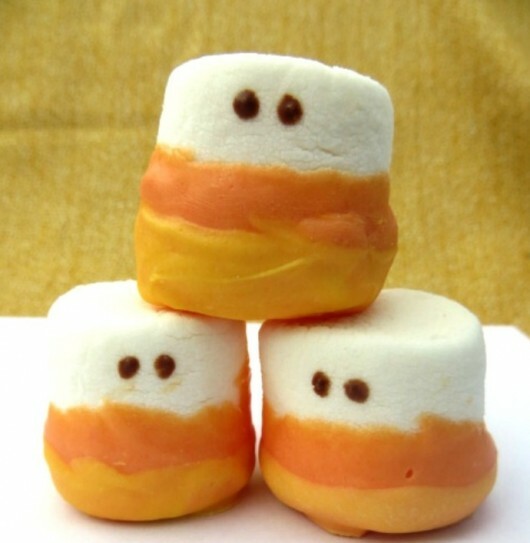 Create eyes on each marshmallow. 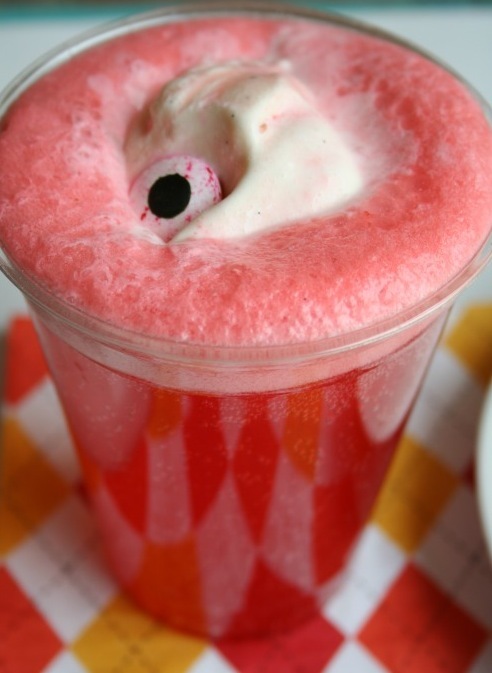 To make an eyeball, put a blueberry into the lychee to make the pupil. Mixture the 7 UP and Hawaiian Punch in about 1 to 2 ratio. Add the eyeballs in the glasses or punch bowl. Mix the nut/sun butter, sweetener, and salt. Melt until it looks like a lump-free paste, add the vanilla extract and pour over the cereal. Stir very well to coat all the crispies. Line a pan with wax paper and spread the mixture evenly into the pan. Place a sheet of wax paper on top of the mixture, then press down as firmly as you can. Freeze for at least 30 minutes. Slice and add sticks if desired. Slice a small “X” into the center of one end of each piece of cheese. 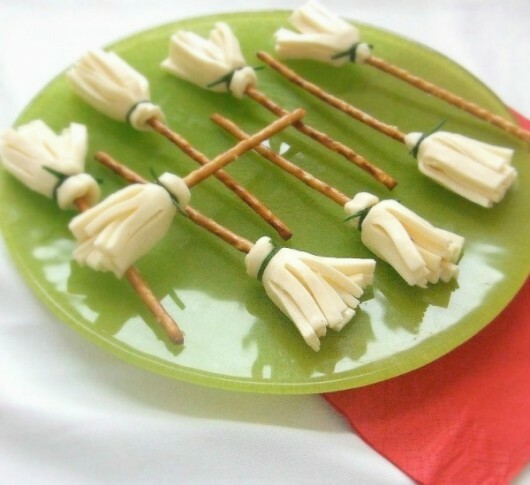 On the other end, slice through the cheese about 1/3 of the up, all the way around to create broom bristles. 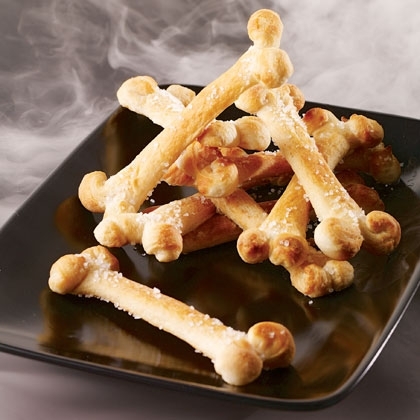 Stick the pretzel into the scored “X” on the top of the cheese. Want to impress your guests even more? 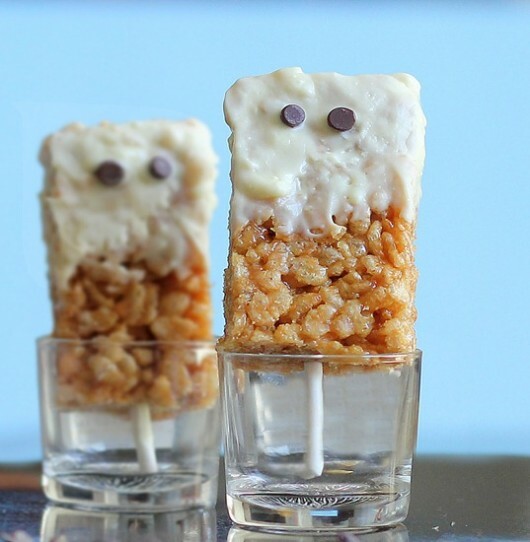 Treat them with these 6 spooky cocktails.